As ready as I said I was in my last post...Let The Big Time Twining Begin...I had to wait until today to begin my first Big Time Twining Rug. The delay was due to...#1 my work schedule, #2 reorganizing studio space and #3...a good nights rest! I seldom if ever begin a new project with my studio in a mess and/or late in the afternoon or evening. I am a morning person! 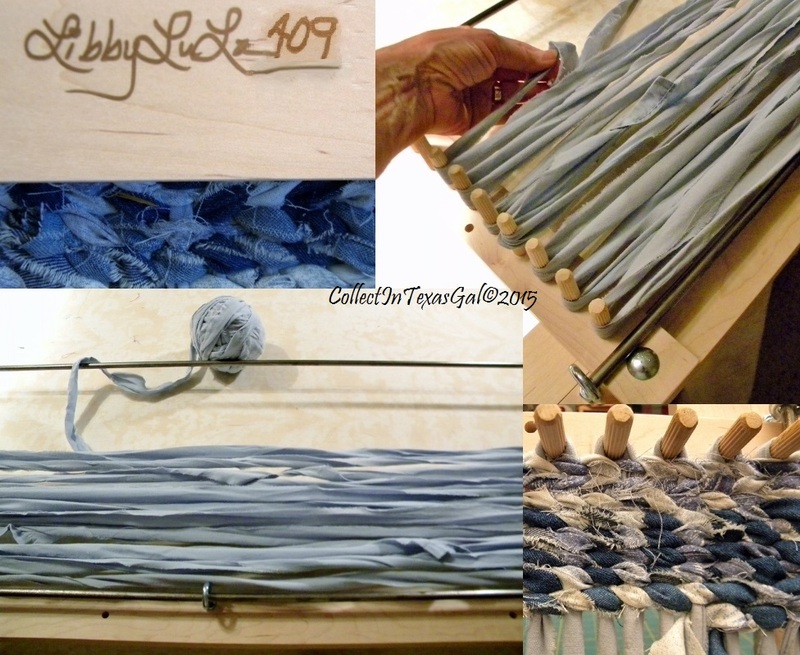 Even after practicing on my homemade loom, there was a bit of a learning curve this morning on Libby. To begin with, I increased the size of the warping strips from a scant one inch to a generous one and a half inch. This I knew would accommodate the heavier weight of the denims I planned to use for this first project. Then, I had to reacquaint myself with making the turn at each of the rods that keep the rug sides straight. It is the trickiest part...so back to the U-Tube video. ~Start with small project...Table Runner. 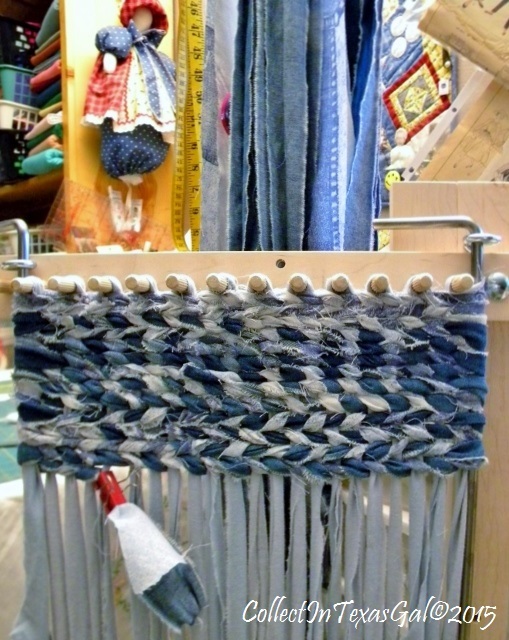 ~Set Loom at a height that doesn't strain neck and shoulders. ~STOP when neck and shoulders start aching. ~Beware of low thread count fabrics for weft...they ravel, ravel, ravel...that means they shed, shed shed little threads! ~Work with 45 inch or shorter length strips. Reduces raveling and easier to pull through warp. ~Weave (twine) with a light and dark strip...makes the pattern stand out. ~Slit Loop connect a lighter weight fabric to the heavier weight denim and visa versa. This makes a less bulky connection than denim to denim...keep the light and dark color combo going. ~Make the Slit Loop connections at least three inches from each side. Having a connecting change on the side is hard to work in and hide. ~Work four or five inches at the top of the loom then flip it over and work four or five inches on the bottom. These rows will be the ends of your Table Runner/Rug. If you want balance repeat the rows as close to the same color strips as possible. ~Clip and pull ravel threads as you go. Gives your neck and shoulder a chance to rest. ~Take a break often to hydrate...this might drive some to drinking...how does a Margarita sound? ~Take a break after five or so inches and take a picture...then go brag blog about it! Work tends to interfere with fun, but glad you could get rolling. Very cool. Rest often and avoid neck strain. Too many margaritas could prove to be creative or a fiasco. But keep blogging about it. Have fun on this new twine of thought. So much to think about! Working with different weight fabrics must make it extra tricky.